Today, I ventured outside my narrow comfort zone of the early Medieval Era and into the late Medieval Era. The models belong to a friend who is building a War of the Roses army from Perry Brothers metals and plastics. I have never owned any Perry figures, but they live up to their reputation - well sculpted, nicely proportioned and excellent poses. 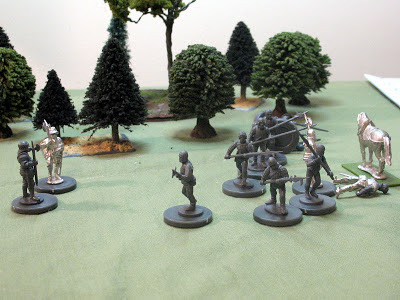 The rule set was By Arrow, Bill and Sword; a free skirmish level set put together by Silent Invader from the lead adventure forums. Initiative and activation is determined by randomly dealt cards (visible in the background above). We added a gameplay element not specifically present in the rules, in which we laid the activation cards face down behind each unit. Players couldn't change the order of activation once a turn began, but the opponent did not know the order attack as well. Melee was a bit slow at first. I thought it odd that a model's "to hit" number was the same no matter the quality of the attacker. 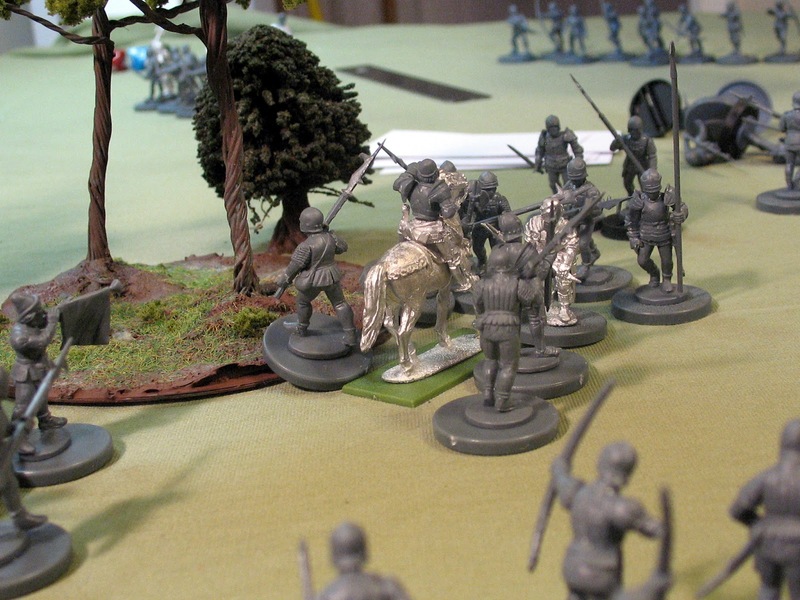 The advantage for superior troops, the captain and men at arms, was mainly defensive - better save dice numbers. 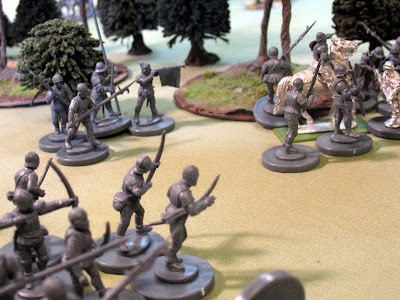 Above: A mixed unit of York pike and longbow prepares to flank an advancing Lancaster line. Above: The battle ended when my billmen unhorsed and killed the York captain. 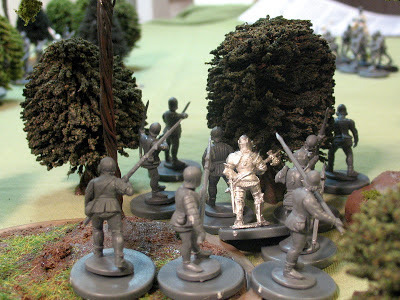 His whole band fails a morale check, handing victory to the Lancaster forces. The learning curve for the rules was very quick and adequately captured the flavor of the period. They could probably easily work for late HYW or Hussite Wars as well. As we were playing without cavalry units, I think another play through is in order in order to fully test the balance of troops. Out of curiosity how many figues did you use for this? Each side has less than 24. The Lancasters had a few more in total, but the York force had more Men at Arms. I am not really sure how exact size or balance is determined in the rules - I did not see a point system. I asked SI that too he said its based on what you and your opponent agree on so that you can have odd number battles. I was just curious how small and how big you can take it with these rules. These rules allow for up to 200 miniatures per side. You are correct. He is a former student of mine from many years back, and we represent almost the entirety of the medieval/ancient wargamer crowd in our corner of the state. Plenty of 40K and FoW gamers, but we're trying to recruit more.